We did Barb's Winter Weed Study but never posted it. Shame on me, I know. I guess this is a time when I will say better late than never. Right? Oh come on, agree with me! So what did we study? We had this little blue pool outside that we had soil in and let it alone to see what would plant itself there. Figures something prickly but yet interesting. It is the sow thistle. It first has yellow flowers then it gets those white puffy balls. 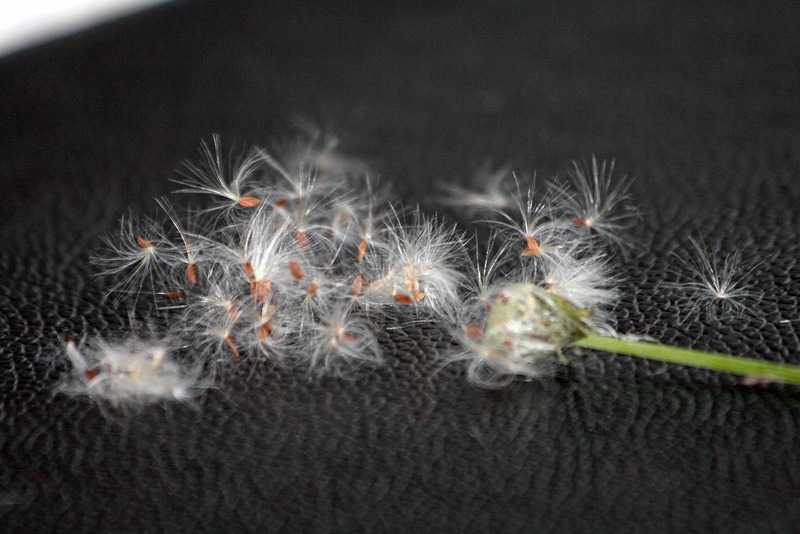 It's the seeds. 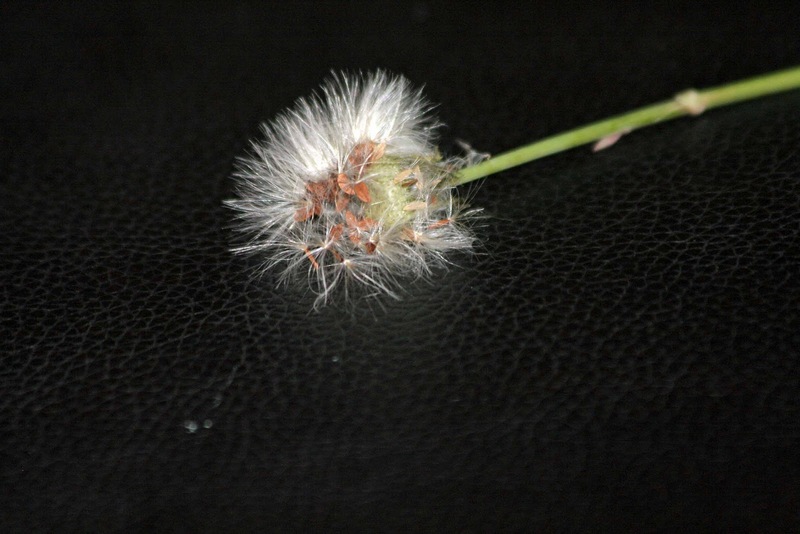 Here is the close up of the seeds and a flower still ready to open up. I forgot to turn off the ceiling fan. Here you have what happened. I had to put my hands around it or else we would have them flying all over the house. 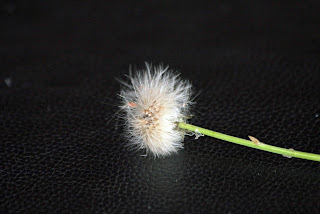 We looked up some information on this plant and I read that is has become a troublesome weed. HA! Don't I know it. We also learned that its milky sap was used for eye ailments and skin eruptions, while a decoction of the leaves and stems was used to make the complexion soft and clear. I was always told as a child to be careful with the milky sap because it could irritate your skin. So I found this interesting. I also have some fond memories as a child going to pick these and blow on them to see the seeds fly. Of course, my little one enjoyed doing that same thing. Ok, so you saw our 3 rabbits we got a while ago, right? Here they are. They get big pretty fast. Now introducing the newest to our pen. This is a Californian. She is now 6 weeks old. Middle son named her fluffy. Hhmmmm, wonder why? So here it is!! The rabbit area is done. Phew! It was lots of work to do all that. But it's done. Here is what the side looks like. The edges still have to be finished but mostly it is done. This is the back side. Yes there is a tree very close but I didn't want to chop it off because it provides shade for the rabbits. Oh and we have rabbits already. We have three. Two guys and one girlie. The ceiling is not completely done. We had to put up a barrier between the top and the rabbits because of the heat. The sun hits that tin and it was very hot one day. The rabbits are 10 weeks now. We will not be having babies till around the end of November. So lets see how son does. So far so good. He gets up early to go check them out and then gives then their feed before our dinner. Now we have the chicken area to get done. I am hoping it will not take as long as the rabbit area did. We should be able to work on it this weekend. Uugghhhh and it is getting hot already. Oh and there are mosquitoes already. I hate mosquitoes. So that is our update. Next time hope to have an update on the chicken coop. So here is an update. We took all the old rotting wood off and replaced it with new boards. This first picture is the whole area in the back. The closed off section is for the chickens and the open area is for the rabbits. We still need to put up some chicken wire and replace one sheet on the roof. As you can see from this picture it is bent and torn from the wind. We are also making an outside area for the chickens to come outside during the day. We still have a mess out there but little by little it is getting done. It is really looking good. Middle son has been going out there on his own and getting a few things done here and there. He is looking forward to having his own animals. Of course, I am looking forward to the eggs and meat. In the garage we have four of the cages already done and ready to take outside as soon as it all gets done. So there you have it. 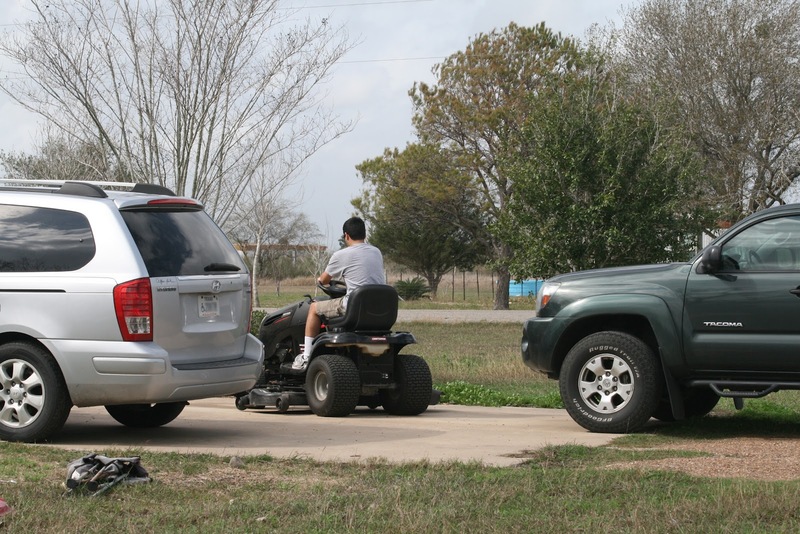 My middle son is enjoying being outside and working now that the weather is not hot yet. Here is where we are on that project. We tore down some rotting wood and the walls to replace them. We still have so much to do but it is coming along. Before you know it we will have chickens and rabbits in there. Since it has been raining and pretty wet we have stopped going to the back to work so we started in the garage. Half is hubby's side. The side with all the tools is his, of course. The other half where we are now WAS where my van went. Now it has a ping pong table set up that was for the game but at the moment we are in there working on the rabbit cages. We have two cages almost all done. They need the doors but they are all put together. We are working little by little toward the goal of being more self sufficient and letting our son learn by his projects and hard labor. In Barb's newsletter on page 9 she has a grid of things to do outdoors. Saturday we had a busy day with our weekly trip to Rockport to participate in an ASL class. It was a rainy day, all day. That night we had some strong storms pass through and I got to take some great pictures of something interesting in my backyard. 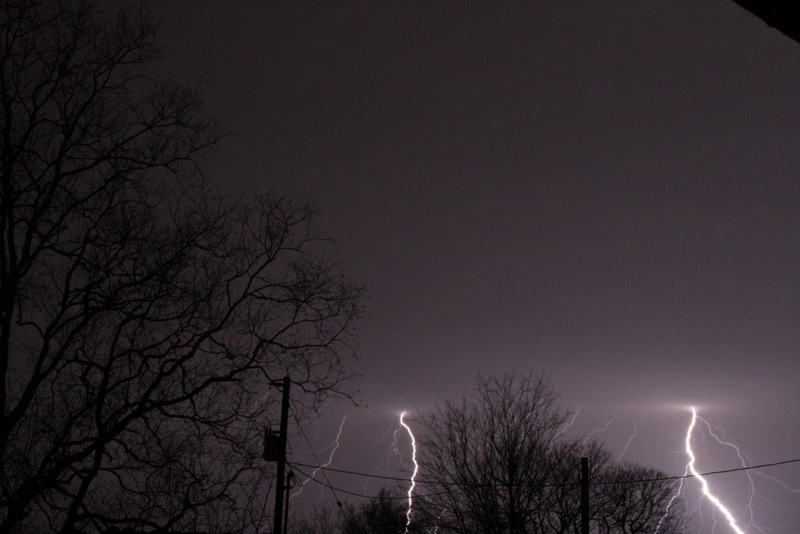 Now I wasn't outside for these pictures, sort of. 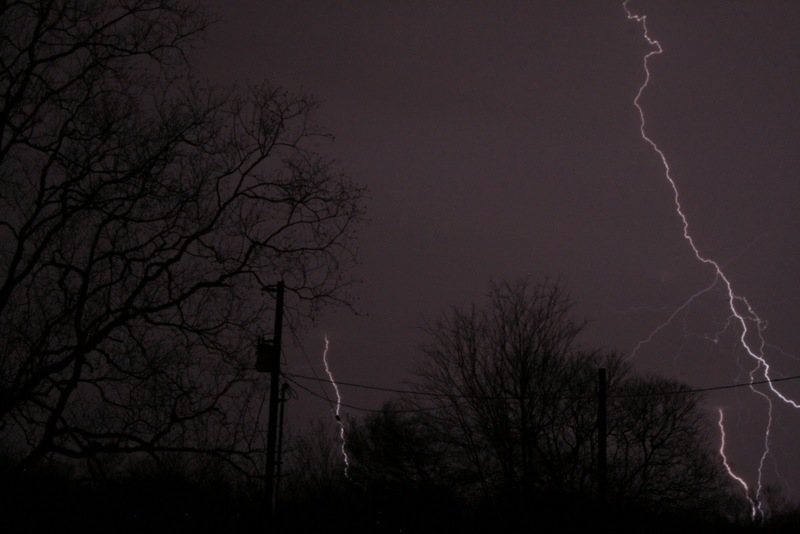 I was in the garage with my camera set up and I got a few great pictures of nothing less than lightning. I consider that as something interesting in our backyard. What do you think? Isn't that totally awesome? Isn't that something interesting in my own backyard? Although it was a bit scary, it was so totally awe inspiring. We were all excited to see these pictures. We are having a very interesting and incredible start to this year. Drought is the number one complaint for our part of Texas but now starting at the end of January this is what you see on the trees. The leaves are starting to pop out. We looked out the window midday and admired the green leaves starting to come out. Soon it will be hot and those leaves will shade the swings and the pool area. We went outside to walk around and see what else we could see and seems like everything is starting to bloom. I have a big cactus plant and look at those beautiful buds. We love looking at the reds coming out of all that green. We enjoyed seeing another bud closer to blooming. Can't wait to take a picture of that when it opens all the way. The last crazy thing we saw outside is my oldest cutting grass. Not that he never cuts grass but although we are in a drought the weeds keep popping up and since the grass is almost dead the weeds have taken over. This is February and this is the earliest we have ever mowed. Wonder what other crazy things we will see as we enjoy going outside to take in the air and get some much needed outdoor time. We had fun learning a little bit about our feeder bird this week. We put a couple of feeders outside the window and put my desk right in front so I could keep one eye on my work and another on the birds. Of course, I love taking pictures of birds. 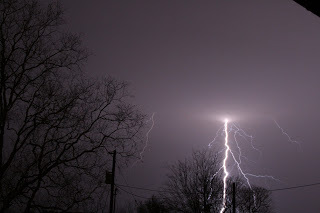 Really, I love taking pictures of any of God's creations. 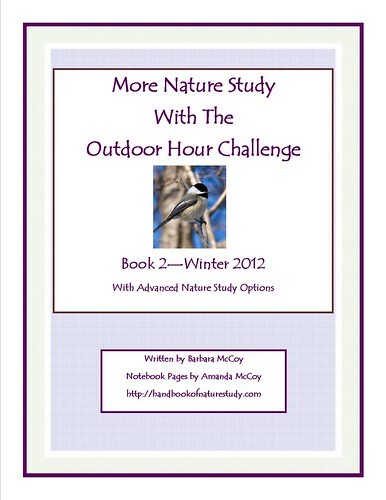 We are trying to keep up with Barb's challenges over at Handbook of Nature Study. Here is what we decided on since we haven't seen any chickadee's on our feeders. 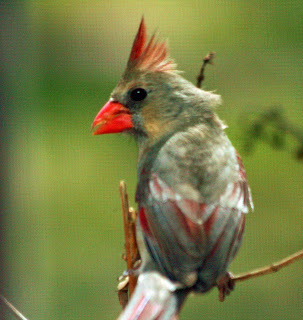 We decided on cardinals. They are such beautiful birds. Both male and female are beautiful. We always stop and watch them when we see them fly around. This beauty is the female. We were also able to observe the male at our window. Then we got down to our page provided by Barb. My son was not in the mood to sketch the bird although I would have liked him to because I think he can draw a pretty cute bird. Maybe next time he will. He liked the idea of the photo. He laughed and said he cheated. Then I looked up some coloring pages I had downloaded a long time ago and used those. My son wanted me to do a page with him and I did. My arthritis sure makes it hard to color and I love to color. It took me a while to finish coloring my page because I had to come up with creative ways to hold my crayon so as to avoid pain in my hands but I got it done and he was happy we both did the page. My middle son is the outdoors sort of guy. He loves being outside and doing outside things. He has been wanting chickens for a while and hubby finally gave him permission to have his own animals. Not that we are against animals but time is very limited and although some animals require lots of time these don't. What am I talking about? Chickens and rabbits. He chopped off a limb that was in the way of the shed he will be using. He is muscle man at work with the ax I went and bought him. He is starting to slowly gather his own collection of tools. Since we have a few acres out back that we never use except to have it grow and have someone come cut it for hay we figured now would be a perfect time to be out there because the grass has not started to grow yet. The chain link fence back there is the neighbors property. They had chickens, goats and a donkey out there but they are MIA. I don't know what happened to them. Maybe they got tired of them. Anyway, this is the shed he will be using. This shed was on our property when we bought it over 10yrs ago. We never went back there for anything till today. We cleaned it out. If you click on the picture you can see it up close and there is rotting wood in there that will need to be replaced. Hubby is thinking with a hundred dollars it will be good as new. hehehe I think not but ok. The enclosed part will be the chicken coop and he is going to add an outside fenced area for them in front of the enclosed side. The open side will be for the rabbits. Right now there is lots of clean up work going on. We have a pile of limbs and old rotting wood that needs to be burned. Hhhmmmm, wonder if we still have a burn ban? I'll post regular updates on the progress so come back and check it out. It was a Whooper of a Day! It was Saturday morning on our weekly drive to Rockport for our class over there and we saw something we didn't expect on the side of the road. There was a big huge bird feeder. I'm calling it a bird feeder because of the birds we saw feeding under it. We had been on the lookout for whooping cranes and that is what we saw. They were eating the feed that wasn't intended for them but I am glad they were. We turned the van around and went to watch for a little bit. There were others there observing also. They are actually really big. We looked it up and males about 5ft tall with a wingspan of up to 7.5ft. Came you imagine that? We were very far away but I always carry my extra big zoom lens so I got some pretty good pictures. The whooping cranes winter in our area. We were very excited to see them. 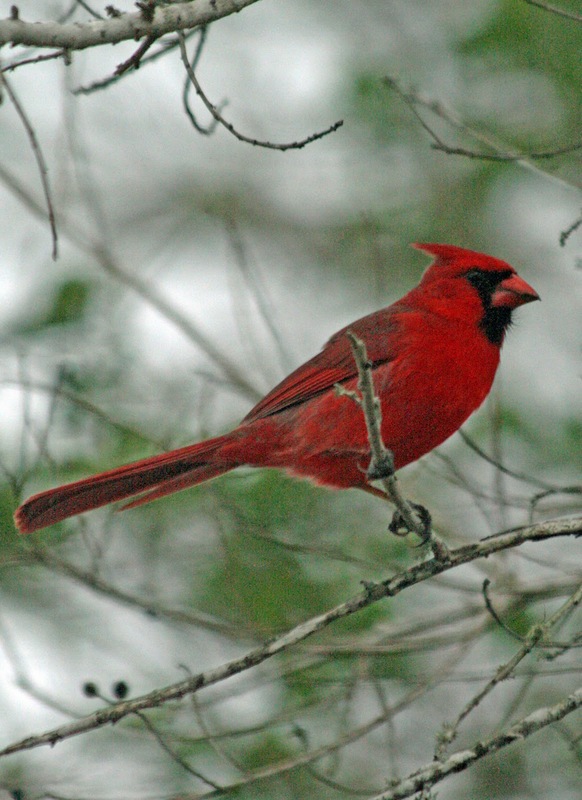 They are endangered and only around 300 birds are in North America. They are really beautiful birds. We finished our first Winter Challenge. Although I wouldn't call our weather winter but that is besides the point. My little one and myself went for a walk outside the house. We live in the country and on a dead end road so we don't have much traffic. It's very relaxing to just go for a walk. We did our Winter Wonder page first. We talked a little and then told him to be very quiet and listen and had him tell me what he heard. It's cute to see what he wants to do. The first is a stick house. All three of his things to do this winter are perfect boy things to do and we have enough land for him to have hid outs. He also did the Winter Weather Walk page. I love his drawing. He said it was a house with wind and snow. My boys love snow and we don't get much or any at all. This year we will not see any. The last page was cute too. He had a fit though because he couldn't draw the leaf we found. He drew and erased and came to me and said I can't draw this leaf. So I helped him out and showed him that I don't know how to draw well either but after we finished with my pep talk and my drawing he noticed it wasn't that hard after all. So maybe next time he will want to draw more. I want to get him also to add more color to his pages but I started him out slow and not adding a lot. I'm glad that everything is all prepared for us to do. Just go out and have fun. Thanks Barb for making this available for us. We are having fun and starting on our next challenge. Haven't seen any chickadees around here so let's see which bird we decide to do. I haven't decided how to bind these pages so I'll just hold on to them till I decide if I want to spiral bind it. After our regular school work my baby got a fun project to do. I had gotten this a long time ago but had it away for the right time. Actually, I will not lie...I forgot about it. Yesterday I started cleaning out and throwing away and there it was. Now my son has something fun to do. It came with sandpaper to sand the edges and make them smooth. There he is with one piece of the project in his Mario pj's. This is his new desk and his area for school. That is actually an old desk but it's new to him. Here is the project. It is supposed to be a car. How cool is that. I found it at the dollar store. He is enjoying it so I think I will need to find him more of these sorts of projects. I came into the kitchen today and guess what I found waiting for me? hahaha Every time I remember I have to giggle. Check this Youtube video out. Looks like fun, right? I have decided to join in on these nature studies. Let's see how this goes. We decided to use More Nature Study with the Outdoor Hour Challenge Book 2. Everything is explained in Barb's e-book. There are 10 lessons and my boys will definitely want to do the magnet and the sheep lessons. Of course the bird, tree, quartz, pansy, moon, winter weed and winter insect will be fun too. I like the fact that this e-book was made with children of all ages to enjoy so my young one and my high schooler will be doing this. There are coloring pages which I love to do and my little one will get into it if he sees me doing it. Can't wait to get started. Now who has sheep we can visit during this study? Hhhmmmm?? After our ASL class today we make a little stop by a beach area. We were happy to see these beauties. The American White Pelican. Isn't it beautiful! There were several on the rocks. I'm sure the rocks looked nicer before they made their stop there. Yuck!! Of course, I didn't notice that until I uploaded the pictures onto the computer. You can see so much when you put a picture on the computer. There is a Brown Pelican in the water. They come by this area during the winter even though our winter has been very mild so far. Today it was 77degrees. Not only was it warm but the fog was crazy. There was fog in one area and not in the other. Do you see the Great Blue Heron? It was a nice treat to our day of learning. We are done with week 8 of ASL class. Maybe I can get the guys to take me for some more fun and nature observations. I'm ok as long as I can talk about it! The following affiliate links help us with our homeschool costs. Thank you for using them.